← Verbatim Verboten and other Upcoming shows! Nerdgasm! at the Queer Arts Festival. NERDGASM! will be blowing your minds on Thursday June 28th at the Garage 715 Bryant Street in San Francisco. NERDGASM is an explosion of all things Nerdy! This wild romp features nerdy queers of all stripes. If you’ve ever fantasized about Spock and Kirk getting busy or wondered exactly what Princess Diana did in her free time on paradise Island you are the audience for this show. Poetry, Storytelling, Comedy and more 100% nerdy. NERDGASM Thursday June 28th 8pm @ The Garage 715 Bryant Street SF, $12 at the door. Terry Taplin is a 21st Century poet and arts-educator born and raised in Berkeley, California. He has taught Poetry and Creative Writing in High Schools across the Bay Area and beyond and represented the San Francisco Bay Area at several national Slam Poetry competitions at the youth collegiate and adult levels as a member of: The 2006 Bay Area Brave New Voices International Teen Poetry Slam championship team, as Youthspeaks Teen Poetry Slam co-champion alongside Isaac Miller in 2007, a member of the 2009 UC Berkeley Slam team ranked 3rd in the nation at the College Unions Poetry Slam Invitational and as a member of the 2010 San Francisco Slam Team and 2011 Berkeley Poetry Slam Team. Sharing the stage with acts ranging from Mos Def to Massive Attack, his poetry has been heard in venues across the country from The San Francisco Opera House, Herbst Theater, and The Masonic Auditorium to the Spertus Institute of Jewish Studies in Chicago, IL and the Apollo Theater in Harlem. 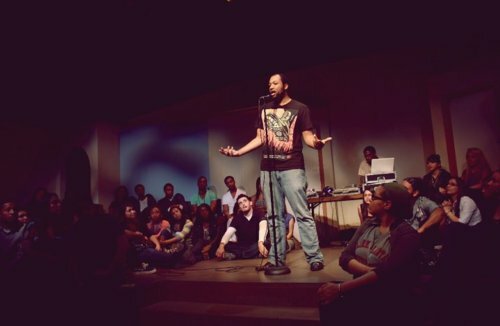 His work has been featured in Poetry and Lit venues up and down the coast including Southern California’s LionLike Mindstate and the Hollywood Poetry Slam, and the Berkeley and Chico Poetry Slams in Northern California as well as the local literary series of New Poetry Mission in San Francisco and Lyrics and Dirges sponsored by Pegasus Books. Taplin’s poetry represents the transcendental alchemy of an opulent verse. Ever relentlessly championing the Natural World, it is a Hammer raised in response to the Cult of Modernism and a reconciliation of Masculine and Feminine Forms. Shot through with a savage and unforgiving Beauty, Taplin’s work reaches for nothing less than the Music of the Spheres.